The vast collection of contemporary hits and timeless classics are now available for online shopping with the launch of Disney’s digital music store. Making it even easier to give the gift of Disney music, Disney Music Group also created Disney music gift cards, for sale at Wal-Mart and grocery retailers everywhere. Both the gift cards and the website (www.disneymusicstore.com) launched December 2012. 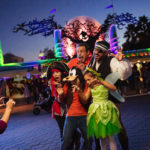 Like gift cards from online retailers such as iTunes and Amazon, Disney music gift cards make music shopping simple and are perfect for graduation, birthdays and other special occasions. Consumers buy the cards, with face values of $15, $25 and custom variable amounts, at stores where cards are activated upon purchase. From there, users may go to the online store, enter a code and shop for instant downloads from a menu of over 12,000 tracks. 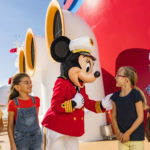 The Disney digital music store is unique as no other music/entertainment brand offers such a vast array of top quality family-friendly musical entertainment that parents can trust and feel safe about their kids interacting with. 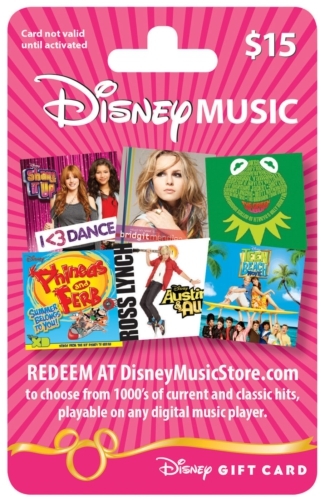 The catalog of music available at the Disney digital music store includes current hit artists ( Selena Gomez , Bridgit Mendler , and Demi Lovato ), Disney Channel series and original movie soundtracks (Shake It Up, Austin & Ally, Let It Shine), film soundtracks (Brave, The Muppets, TRON: Legacy), inspired-by compilations (Frankenweenie Unleashed!, Muppets: The Green Album, Almost Alice) plus classic soundtracks (Beauty and the Beast, The Lion King, The Little Mermaid), Disney Junior soundtracks (Sofia the First, Jake and the Never Land Pirates), Disney Princess and Fairies compilations, Radio Disney favorites, Spanish language, Songs & Story, and many more.